Raisins were used in many holiday recipes a hundred years ago. They were popular because “modern” technology enabled them to be produced inexpensively. And, once produced, they were easy to transport to even the most remote locales. People had more raisin choices back then: seeded (seeds extracted), seedless (made from seedless grapes), and cluster (on stems, not seeded). Why would anyone would want the cluster variety? Did people remove the seeds and stem them after they purchased the package? It must have been a real pain to get them into a form where they could actually be used. Posted on December 3, 2015 November 30, 2015 by SherylPosted in AdvertisementsTagged raisins. I wonder if the clustered ones were cheaper, since they were less processed and you actually got less raisins for your money? I’d also guess that the clustered ones might be cheaper. Do you have any raisin recipes? I have one from an Amish cookbook that has raisins in a vanilla custard pie. It could be an old recipe, but maybe it’s not. I’ve posted several raisin recipes over the years. One was for Raisin Meringue Pie (Funeral Pie). It isn’t exactly a custard pie–but the raisins are in an egg-based sauce (and topped with meringue). Another recipe is for Raisin-Filled Cookies. In Australia we can get raisins and golden raisins, sultanas and golden sultanas, muscatel clusters, seedless muscatels and currants, which aren’t grapes but can be used in the same way. I’ve never used the muscatels. In an average supermarket in the US, you can get raisins, golden raisins, and currants. I’ve never looked for raisins in the more upscale stores like Whole Foods so I don’t know if additional varieties might be available some places –but now I’m curious, and may have to check it out. Maybe they hung them up instead of mistletoe at Christmastime. Enjoyed the information on food energy value. Interesting–I had no idea that cluster raisins were still available. I’m definitely are going to have to look for them. They sound like they’d make an interesting additional to a cheese/fruit tray. Raisins are a staple in my cooking, and I just checked my box of SunMaid raisins. That same lovely girl is on the package. It’s one of the few companies I know that hasn’t changed their primary logo. As for the raisins themselves, I stir them into oatmeal or other cereals, use them in cookies and cakes, love them in sour cream raisin pie, and even use them in some meat dishes. My favorite cookie has a short crust folded around ground, spiced raisins. And, my diabetic friends carry the small boxes in their purses or bags for a little shot of sugar when needed. It is amazing that they’ve kept the same logo for a hundred years. It sure is an enduring image. Raisins are a versatile food. The spiced raisin cookies sound awesome. I love raisins, and they are pretty much a no-no on my nutrition program — loaded with sugar. Why is it that the tastiest foods never seem to be the healthiest? 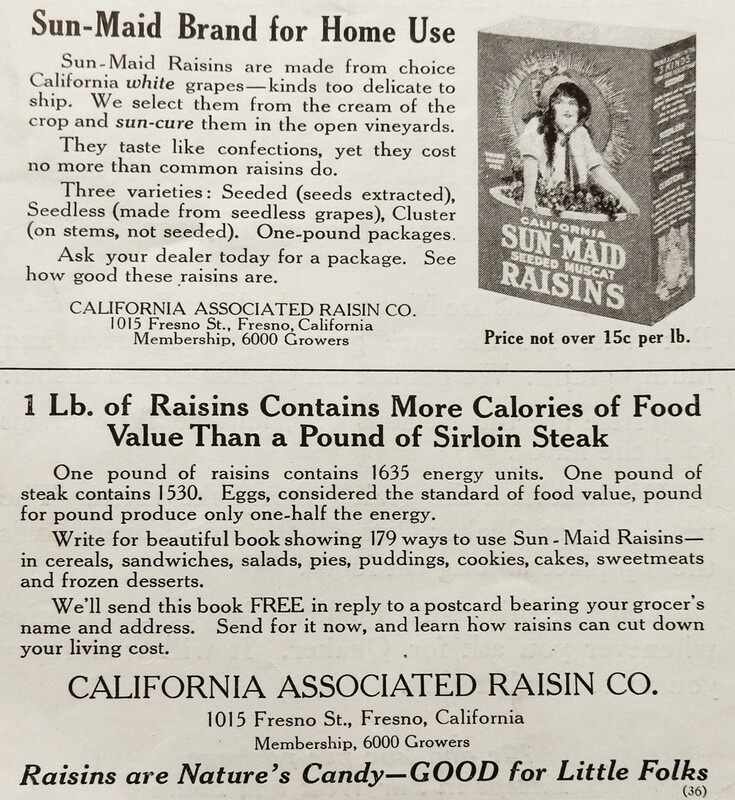 An ad where raisins had seeds and calories are considered GOOD things–so obviously not a modern ad campaign! There you go talking about raisins again! I like to throw raisins in my oatmeal. I never knew you could buy a cluster of raisins. Oatmeal is definitely better when a few raisins are added. I never knew raisens had so many calories! Back to an apple in my oatmeal when I’m cutting down calories. That or just eat a steak for breakfast. I’m noticing in my old books people eating steak for breaksfast. 🙂 Now we have a reason for eating steak at breakfast. This brings back some memories! My father loved raisins and could never understand why I disliked them so much. (I don’t understand why, either!) Once when I was about five or six, I was at a birthday party and bit into what I thought was a chocolate chip cookie. But it was a raisin cookie and I couldn’t keep it in my mouth, let alone swallow it. So, as discreetly as possible, I took the bite out of my mouth and stuffed it between the cushions on the couch. To this day I feel guilty about not disposing of it properly! LOL What a great story! It’s amazing how we remember things like this across the years. I’d be interested to see what clustered raisins look like! Maybe. . . they don’t sound like anything that I’d be very likely to buy. I remember getting sun maid raisins in my lunch as a treat when I was a child…later I graduated to chocolate covered ones😄. Interesting about the calories! I love such posts as these. Cool! I’m glad you like them. I have a lot of fun pulling the materials together for this blog. I bet! 🙂 We also learn from them!